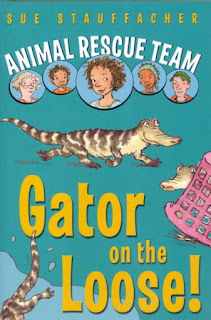 Books & other thoughts: Gator on the Loose! Ten-year-old Keisha is manning the phones at the family business, an urban wildlife rescue organization, when she receives a phone call from the manager of their local swimming pool. 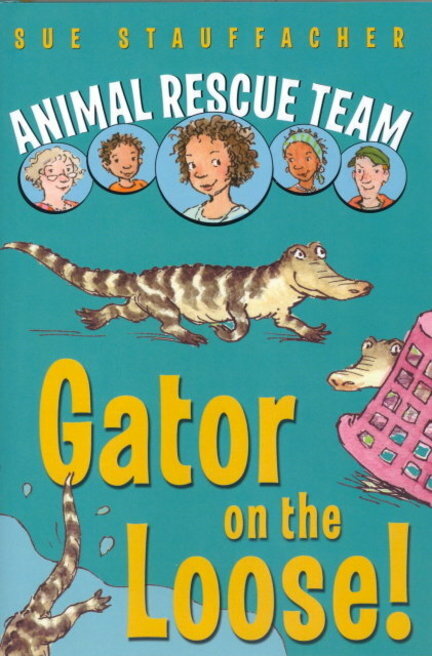 When she learns that an alligator has been found in the pool, she knows she has to get her family together so they can rescue it safely. After all, it might be a warm summer day, but Michigan is certainly no place for an alligator. Not to mention the fact that the pool will remain closed until the alligator is rescued, and Keisha has big plans for practicing her cannonball. This is a sweet, funny book about a family that works together to accomplish some pretty important goals. I particularly enjoyed getting to know Keisha's family, from her funny little brother to her slightly goofy grandma. I liked that fact that her family is racially mixed, but it's just a matter-of-fact part of the novel, not the point of the story. Keisha is a clever, resourceful heroine, one that readers will be rooting for, and along the way they'll learn a little bit about animals, wildlife rescue, and responsible pet ownership.